but most of our revenue comes from tuition,” Glaser said. “Naturally, some are unhappy with the increase, but students and their families are often also urging the university to do more.” Since the announcement, many students have voiced their frustrations over the increase, and one of these students, Elizabeth Dossett, a Tufts Student Action (TSA) member, said that the increase cannot be justified. “This is a trend that needs to stop,” Dossett, a senior, said. “The growing trend of higher education getting more and more expensive every year is a product of money being pooled in admins’ salaries and in endowments, rather than actually going toward students needs, staff needs, financial aid.” Another TSA member, Karen Ruiz, echoed Dossett’s sentiment, noting that tuition increases have become a fact of life at Tufts. “First-years will be paying almost [$]80,000 by the [2021–2022 academic year],” Ruiz, a first-year, said. “And that’s not to mention how [much first-years] four years ago have had to pay.” The increase should not have a significant impact on the number of students that Tufts can support with financial aid packages, according to Glaser, who noted that the university has a “full-need aid” policy. Alastair Cribb, the new dean of the Cummings Schools of Veterinary Medicine, is pictured. Cribb cited his time running UCVM while it was a new school as an asset that has given him knowledge about every aspect of running a veterinary school, and he also said that UCVM prepared him to work in the community. “I really recognize the importance of getting out and meeting our own people where they work, but also interfacing with the community,” Cribb said in an interview with the Daily. Cribb said that he was drawn to the Cummings School by both its research achievements and its unique culture. the sake of making them, but I am happy to make changes if it’s going to make it the school that we want it to,” Cribb said. Cribb noted that the kindness, respect and professionalism he faced throughout the selection process has energized him to work at the Cummings School. “Even though I’m not there yet, I’m really starting to feel like a member of the Cummings community, and I’m really looking forward to arriving and getting to know everybody and helping to move the school forward,” he said. 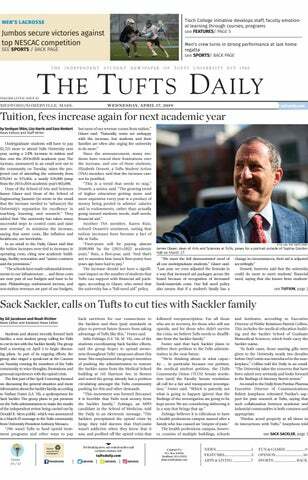 continued from page 3 financial accessibility at Tufts at a relatively low cost for the university. “This resolution isn’t calling for something like the printing stipend, for all students regardless of financial aid,” Rivera said. “This is something that would have a big impact on the lives of a very small community. So the financial footprint that this would add to the administration is actually very small.” TCU Senate also reviewed the remaining portion of the 2020 budget, for the media organizations of Council 3, which was tabled at last week’s meeting. The Council 3 budget was passed, allocating $124,704.07 with 24 senators in favor, one opposed and two abstaining. Some questions were raised by senators regarding the high cost and subsequently high budget for The Observer, which had a proposed budget of $40,684. However, after discussing various factors such as the price of paper, alternative vendors and various production schedule lengths, the TCU Senate approved the proposed budget total. The TCU Senate also heard several supplementary funding requests. Global China Connection initially requested $200 for a boba tea event, but the Allocations Board (ALBO) recommended $0 because they did not feel it was in line with the organization’s mission, according to Chouhan. The TCU Senate voted in favor of the ALBO-recommendation for $0, with 20 in support and seven opposed. for additional food at its Pasar Malam event, according to an ALBO report. The ALBO-recommended total of $250 was passed by acclamation. According to an ALBO report, Tufts Consulting Collective requested an additional $80 for food at an upcoming presentation, which was passed by acclamation. The TCU Senate ended its meeting after midnight. Elections for all Senate positions for next year will be held on April 17. Professor Deborah Donahue Keegan, in charge of the social-emotional learning Initiative by Tisch College, poses for a portrait on the academic quad on Sept. 30, 2017. make the workshops engaging for faculty and administrators. Woolf said that because he went to Tufts as an undergraduate student, he understands how important it is for faculty to be aware of the social-emotional dimensions of learning and teaching, as well as how to develop their own SEL skills. He explained that having faculty who integrate social-emotional learning and culturally responsive practices in their teaching gives students the best chance of succeeding in their studies. “The hope is that these workshops can simultaneously upgrade one’s own self-awareness and social-emotional learning competencies, while also equipping individuals with tools that they can bring into the classroom to better serve students. Something as simple as a professor devoting the first five minutes of class time to mindfulness or journaling can go a long way, especially considering how stressful the academic rigor of being a college student can be,” Woolf explained. Woolf went on to say that by educating faculty on social-emotional learning, they will be more equipped to teach students emotional intelligence in the classroom setting. “A common question — and this is the same if you look at K-12 schools tackling social-emotional learning — is why do you start with the adults and not work directly with the students? The rationale is similar to why flight attendants always tell you that you should put the oxygen mask on yourself first before turning to help others in the event of an emergency. We as humans are better able to help others if we are constantly improving ourselves first and foremost. The best mentors have invested significant time and energy in improving their own emotional intelligence, which then spills over into a greater capacity to coach and develop others,” Woolf said. Ryan Rideau, the associate director for Teaching, Learning and Inclusion at the Center for the Enhancement of Learning and Teaching who serves on the Board of Directors for the initiative, consulted with Donahue-Keegan about the initiative. He explained that having a program dedicated to social-emotional learning is vital, considering that research finds it is imperative for having a positive learning experience. Donahue-Keegan stated that 40 senior Tufts administrators have already signed up for the May 10 event. In terms of the future of the program, Rideau believes that the program will continue to expand as it has received positive feedback from the community. “I see the program continuing to build upon the momentum it has already established. The program has fostered a community of individuals who are committed to centering social-emotional intelligence in their work. More individuals will be invited to participate in the initiative with a goal of integrating these practices throughout Tufts,” Rideau said. 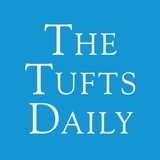 Kawashima-Ginsberg felt that the future of the program will provide more opportunities to work social-emotional learning into the everyday lives of students at Tufts. She believes that this will smooth the transition for many students. “The program is currently focused on faculty and staff, but I think as faculty become more skilled in incorporating social-emotional agility and skills and climate to teaching and learning, I think it should become more mainstream. This means that the students should also start to expect that in every classroom and in every discipline. Sometimes I think that means that students also need to acquire the skill to support each other, while also expecting faculty to have those skills,” Kawashima-Ginsberg explained. Woolf added that the program will continue to expand as a part of the SEL-CE initiative and continues to teach faculty how to best support students. He also said that the program provides a unique experience offered by Tufts to encourage social-emotional learning at the university level. “Something that I’ve really appreciated about working as part of the Tisch SEL-CE Initiative is that it’s such a unique program. Social-emotional learning is a huge buzzword right now, and it’s one of the most frequently discussed topics in the world of education, but 95% of the research and innovation is occurring in K-12. The fact that Tufts is one of the only higher education institutions in the country to be formally investing in social-emotional learning can hopefully serve as a model for other institutions to model,” he said. arathon Monday has now come and gone, and because you’re an avid reader of this column, you learned about the Tufts Marathon Team ( TMT) and coach Don last week. I’m happy to report that the TMT did great as always, with many smiles, hugs and peanut butter and jelly sandwiches being passed out at mile 9. Tufts should be proud of yet another year of stellar participation in distance running’s most storied event. Now that you’re inspired by both my moving prose and watching the marathon on Monday, you probably want to go out and give running a try for yourself. That is an awesome idea, and Somerville has a bunch of great options to test your cardio. But before you lace up, your mans Townie Tim needs to get a few things out there when it comes to running. It seems pretty simple to just throw on some trainers and scamper out of the dorm, but I have a few tips that will make your new footslogging interest integrate smoothly into the community. First, you have to remember that there are other people out there walking dogs, driving cars, unloading boxes and wrangling toddlers. You have to share the roads and sidewalks. I know that while running you can get in the zone, and people seem to be moving at a snail’s pace, but you have to be aware of your surroundings. If you happen to be one of the folks driving around Somerville, do your best to notice runners because they can be dumb about running into the street. This is especially true with crosswalks. I’ve been running around Somerville for three years, and I still run out into traffic like an idiot. No pace is worth an unsafe situation. For this reason, I also have a really unpopular piece of advice for runners: Do not listen to music. This sounds nuts, I know. Music can distract from your surroundings, which can be really unsafe, but it also prevents you from completely embracing the activity. Quite frankly, you are missing about 50% of the pleasure of running if you are blocking out the sounds of your environment. I’ve found that ever since I stopped listening to music, I’ve significantly increased my enjoyment of running. I am always saying that I need to clear my head or get a chance to reflect on certain feelings, and undistracted running has become that outlet. If this is too much of a step, try switching to podcasts first. Now that you’re ready to get out there, you may be wondering where to go. The good news is that Somerville is the start of the Community Path, which is a dedicated walking path that starts near Lowell Street, goes through Davis Square and continues about 20 miles northwest through Arlington. You can also take a route off the Community Path to Fresh Pond in Cambridge or head down to the Charles River Esplanade for a really long run. There are no bad options, but remember to bring some water along. I look forward to seeing you out there. Nate Rubright is a member of the Somerville community. Nate can be reached at nathan.rubright@gmail.com. thing we often take for granted, can influence higher forms of art, such as painting, and seriously change the course of the art that follows it. Toulouse-Lautrec was one of those incredibly influential artists whose talent did all that and so much more. “Toulouse-Lautrec and the Stars of Paris” will be on view until Aug. 4 and is free for Tufts students. immersive, giving fans the opportunity to interact with droids, animatronics, actors and ships in Black Spire Outpost, a village on a planet far in the Outer Rim. Fans got special looks at Smugglers Run, an interactive attraction where visitors will get to fly the Millennium Falcon, as well as Rise of the Resistance, a new, mysterious ride that will open after the parks. Visitors will also get to customize their own lightsaber, build their own droid and taste the blue or green milk like Luke Skywalker. There’s plenty more information to be revealed, including other attractions, food and a Disney World hotel. he Movie: “Strangers on a Train” The Year: 1951 The People: Farley Granger as the supremely stressed-out tennis player, Guy Haines; Robert Walker as the slick psychopath, Bruno Anthony; Ruth Roman as Guy’s supportive, elegant girlfriend Anne Morton; and Patricia Hitchcock as Anne’s inquisitive and unrelenting sister Barbara Morton. Alfred Hitchcock, the director, shows off his knack for thrill-inducing set pieces. The Non-Revealing Plot: Guy Haines meets Bruno Anthony on a train heading from Washington, D.C. towards New York. Bruno, ever the opportunist, recognizes Guy as a successful tennis player and approaches him. Typical for a movie psychopath, Bruno toys with the prospect of committing murder, offering to kill someone for Guy’s benefit in exchange for Guy’s promise to kill Bruno’s father. Though Guy thinks nothing much of the proposal, his joking affirmation to the idea is perceived by Bruno as a true intent to carry out the murderous plan. Soon Guy realizes his mistake and deals with the consequences of having a persistent and cunning psychopath expecting Guy to kill his father. Unofficial Genre: The film is a thriller noir. Wikipedia says that it’s a “psychological thriller … noir.” I disagree. Using “psychological” when referring to the contents of a movie means that there’s a focus on studying or observing or just commenting on parts of the human psychology. This movies involves a psychopath, yes, but no part of the movie even slightly focuses on this complex subject. My Opinion (Emotional): This movie did an excellent job creating a sort of fear and hatred combination for the manipulative Bruno Anthony. Once it clicked that he had sinister ambitions, I immediately felt sympathetic for Guy and fear of Bruno. Critics claim that this film portrays a situation where there’s a fine line between who’s good and who’s bad, but I completely disagree. I think it’s cut and dry that Guy’s in the right and Bruno’s in the wrong. My Opinion (Technical): The action-based thrills weren’t all too horrifying. It was more in the moments where thrills weren’t to be expected — such as a middle-of-the-day tennis match — that I found myself feeling truly scared. The scene I’m referencing is a brilliantly crafted scene where Guy is on the court waiting to play, and he looks up into the crowd where every observer except one is moving their heads back and forth with the movement of the tennis ball. The one observer is obviously Bruno, and he’s staring directly at Guy. What makes this shot and setup so effective is that the movement of the observers’ heads is supposed to make the audience think there is uniformity, which is meant to be soothing. But once we notice that one observer is deviating from this uniform motion — which we notice after a few seconds — we’re uncomfortable both because of the break in cohesion and because this observer is evil. Overall rating: For its impressive set pieces, unique and effective shots and scintillating characters, I would give this film an 8.6 out of 10. I was disappointed that there wasn’t more of a delving into Bruno’s backstory, and felt that that doing so would’ve elevated the story on an emotional level. If You Like This, You’ll Also Like: Horrible Bosses (2011) … Not kidding. Tuna Margalit is a first-year who has not yet declared a major. Tuna can be reached at yonatan.margalit@tufts.edu. A promotional image for Star Wars Celebration Chicago 2019 is pictured. continued from page 7 3. Fans, cosplay and so much excitement Chicago was packed with people wielding lightsabers, fixing their cosplays and buying plenty of Star Wars merchandise. Star Wars actors noticed some of the best cosplays, including a Force ghost Luke that Mark Hamill loved on Twitter. Other amazing moments included most of the Rey cosplays gathering together for a meaningful picture and plenty of Leia’s iconic hairstyles. Lego marked the first day of Celebration by breaking a Guinness World Record with 36,440 Lego storm troopers lined up. Fans showed love for some of the more controversial actors in the series, including Kelly Marie Tran, who received a standing ovation and applause at the beginning of the “Episode IX” panel, and Ahmed Best, who played Jar Jar Binks. 2. “The Clone Wars” (2008–2014) season 7 content After the season 6 release of the acclaimed animated series on Netflix in 2014, many fans were desperate for new Clone Wars content. After Disney announced in 2018 that it was developing a season 7 to be released on Disney+, a short trailer release followed. At Celebration, a panel revealed videos of new content, character designs and details about “The Siege of Mandalore,” which will be the main plot of season 7. A trailer revealed everyone’s favorite character Ahsoka reuniting with Anakin, reclaiming her lightsabers — they’re now blue! — and preparing for an epic duel with Darth Maul. It is expected that “The Clone Wars” will release after the launch of Disney+. 1. “Episode IX: ‘The Rise of Skywalker'” (2019) On Friday, director JJ Abrams and Lucasfilm President Kathleen Kennedy introduced “Episode IX” to the world, along with some cast members — including fantastic Daisy Ridley — and a few droids. Pictures of the set revealed character costumes and names as well as exciting new planets in the film, and the panel ended with a teaser trailer for the film. It’s most definitely the best teaser ever released — Rey runs and jumps onto a TIE fighter, Leia and Rey hug, there’s epic forest battle and an evil cackle at the end belonging to Emperor Palpatine. Palpatine’s actor, Ian McDiarmid, later came on stage to greet the audience. Finally, fans were given the film’s long-awaited title: “The Rise of Skywalker.” The end to the three-trilogy Skywalker saga will release in December. Difficulty Level: Studying for exams in Tisch while it’s nice outside. CORRECTION An earlier version of “Events on the Hill — Week of April 15” stated that the second event for the edible insect festival at Tufts starts at 9 p.m. In fact, it starts at 6:30 p.m. The article has been updated to reflect this change. The Daily regrets this error. n 2017, two cases of measles were reported in New York City. Within the last year, 285 cases of measles were identified in New York City. Think about that. This 142-fold increase has a point source — one unvaccinated individual. This highly contagious disease is fatal, particularly for children and pregnant women who are immunocompromised. Measles’ resurgence has proven to be one of the most frustrating public health crises because the disease shouldn’t even exist. It is highly vaccine-preventable. The measles-mumps-rubella (MMR) vaccine is 93% effective at one dose, and 97% effective at two doses. Mayor Bill de Blasio of New York declared this outbreak a public health emergency. It is important to emphasize the danger of measles. The virus can be infectious before the patient develops the characteristic red splotches, meaning that what seems like a simple cold could actually be a very serious disease. Additionally, even minimal or no contact with an infected person can cause disease transmission. It is an airborne virus, so if someone with measles coughed in a room, their droplets would stay infectious for two hours after said person left. This crisis in New York is concentrated in an Orthodox Jewish religious community in Brooklyn, which is particularly concerning because New York City is such a densely populated area. For context, imagine walking even a block in the City. How many people would you breathe, cough or sneeze on? If you were infected, every single unvaccinated person you came in contact would have a 90% chance of getting measles. NYC, in response, has mandated that all people in certain zip codes receive the vaccine, with the financial penalty for foregoing a vaccination set at a punitive $1,000. This entire scenario reveals a central question surrounding most public health issues of today: Do we prioritize personal freedoms like the liberty to abstain from a vaccine or the safety of everyone else? American values place such an emphasis on freedom that it seems obvious that movements like the anti-vax campaign would surface. While I believe that there are certainly medical situations where personal discretion should be of utmost concern, vaccination is not one of them. I support Mayor de Blasio’s decision to contain the outbreak, moving to more drastic measures — such as shutting down and fining religious schools with unvaccinated children. These actions do not have bad intentions; they represent a more involved effort to contain this threat. There have been concerns that it is not within de Blasio’s jurisdiction to carry out such mandates, but the mayor seems confident about his actions. At the end of the day, vaccination is not only important for individuals, but it also promotes the notion of “herd immunity.” This idea refers to the vaccination of entire populations to prevent the transmission of disease to those who are not immune (i.e. allergic to vaccines, immunocompromised). Mayor de Blasio said it himself: “I don’t think it’s your unalienable right as a United States citizen to allow your child to catch and transmit a potentially fatal infection,” and he is absolutely right. Deeksha is a sophomore studying community health. Deeksha can be reached at deeksha.bathini@tufts.edu. CIO) claimed a defeat for the UFCW workers would result in worse customer service and longer lines for customers, as well as deepening poverty and precarity for workers. In crossing the picket line, we endanger the collective power of grocery workers and give more power to the employers. But taking our business elsewhere is the bare minimum amount of support when workers are standing up to a multi-billion-dollar international corporation. We can also join picket lines, as members of Tufts Labor Coalition and Tufts Dining Action Coalition have; we can bring food and coffee to strikers; and we can offer our company to them in this harrowing time. Given all the talk of community, civic engagement and breaking out of the Tufts bubble at this school, we should live up to our moral obligations as students by standing with workers. Workers need our support, and we should offer it until the company gives in. United we bargain, divided we beg. Members of the men’s crew team row in the regatta against Wesleyan and Bates on Apr. 14, 2018.
raced against Wesleyan, who defeated UMass in the other semifinal. The Cardinals came out on top over the Jumbos, 5:55.9 to 5:59.9. “Wesleyan just had a much faster start than us, and [it was] able to get [its] boat ahead early,” Bell said. “I think we rowed very well through the second half of the race, but from [its] position, [it was] able to just counter any move we tried to make. I think if we can be a little more aggressive at the start, we can put ourselves into a much better place for the finish.” The second varsity eight for Tufts consisted of first-year coxswain Tara Curran, junior stroke Matt Agurcia and junior co-captain bow Paul Gelhaus. Whipple, Mudge, Gilland, Midthun, junior Mitch Koganski and first-year Malcolm Zuckerman filled out the other six spots of the boat. The first race against the Bobcats came down to the wire, 6:16.1 to 6:19.8. The group would also go on to face Wesleyan in the final race. Just as the Jumbos swept the Bobcats, the Cardinals swept the Jumbos in their races. Wesleyan won the final race with a time of 6:16.8 to Tufts’ 6:32.6. Just like the regatta from the previous week, the third varsity eight proved to be the most successful boat for Tufts. In that group, the Jumbos boated first-year coxswain Nilay Maitey, junior stroke Peter Malinovsky and first-year bow Adrian Bauer. First-year Ethan Donnelly, first-year Henry Ross, first-year Matias Facciuto, first-year David Gantt, Braun and Takata rounded out the rest of the boat. On the way to improving to 4–0 on the season, the third varsity eight defeated Bates convincingly in its first race, 6:15.1 to 6:27.0. UMass’ novice eight boat awaited them in the final. In that race, the Jumbos took home the title for their group, defeating the Minutemen 6:20.9 to 6:30.3. Takata commented on why the Jumbos’ most amateur boat is still so successful. “We’re definitely less experienced than the other boats,” Takata said. “But even though we haven’t been together in the same boat for very long, we trust each other. Even though [rowing] seems like an individual sport, the fact that everybody in the boat trusts each other is the most important thing.” The next regatta for the Jumbos is the Baker Cup, hosted by WPI at Lake Quinsigamond on April 21.
t’s playoff season for the Celtic army, and it started with a win that was as underwhelming as underwhelming can be. In the age of pace and space with offensive output at an all-time high, the old-fashioned-looking Cs might as well have been playing in the age of Red Auerbach instead of Brad Stevens. How ironic then, is it, that of all teams, they were playing the Indiana Pacers? A team literally named after the Indianapolis 500 but looked like their fast car got a flat in the third quarter and never recovered. Eight points — eight measly points in the third quarter for those race cars without engines. In an era where the Sacramento Kings scored 48 points in a quarter (Look it up, they did it on April 10! ), this sad stat sticks out like a sore thumb. And yes, you can certainly give all the credit in the world to a Celtics defense that stifled the opposition. But is this going to be enough going forward? Is this going to be enough to down the juggernauts that await them? Let’s start with the good: The Pacers were held to 33.3% shooting from the field, and an even paltrier 22.2% from 3-point land. The Cs pulled down 68 rebounds to the Pacers’ 50 and held Bojan Bogdanovic to 12 points, despite him averaging close to 22 points per game since the all-star game. All good, but all defensive, and caveats must be added. The Pacers went 7–14 in a 21-game slump to end the season without the services of back-to-back all-star (and singer!) Victor Oladipo. A team without much offensive firepower to begin with should not be an apt litmus test to measure the Celtics defense against. Plus, the self-inflicting Pacers did the Celtics a nice favor by shooting 12–21 from the free-throw line. You can only beat what’s in front of you, but you have to look convincing. That brings us to the other side of the floor. What an ugly game and a waste of a Sunday afternoon (sorry, if it was 1966 this would’ve been a classic — there might as well have not been a 3-point line). For all of their defensive dominance, the Celtics themselves could only manage to shoot 36.4% from the field, as Jayson Tatum was the only C shooting over 50% from the field. However, he had a big fat zero in the assist column for a team that only had 18 on the day. Of course, it’s never an encouraging sign when a squad has more turnovers (20) than assists, and with the Celtics’ discombobulated offense, it’s not the best omen. Compound this with the fact that in another Eastern matchup, Giannis Antetokounmpo showed up, pouring in 24 points with 17 rebounds in 23 minutes against a sorry Pistons squad in what basically amounted to a scrimmage. The Celtics have all the reason in the world to be nervous. Bojan Bogdanovic is not Giannis, despite whatever crazy Indiana Pacers propaganda newspaper you may be reading says. Jeremy Goldstein is a sophomore studying political science and film and media studies. Jeremy can be reached at jeremy. goldstein@tufts.edu. the Jumbos were able to score 11 more goals in the third and fourth quarter to win the game by a final score of 19–4. The Jumbos’ survival in the game was accredited to a historic performance by electric senior attacker and co-captain Ben Connelly, who scored a career-high seven goals, tying senior attacker and co-captain Danny Murphy for the highest single-game scoring performance. Saturday’s victory came in the midst of an eight-game string of NESCAC games that began on Saturday, March 23, with a dominating 25–12 victory over Trinity (8–5), and will continue until the end of the regular season when Tufts faces Bowdoin College (6–7, 2–6 NESCAC) on April 24. With five teams nationally ranked in the NCAA Div. III, the NESCAC has solidified itself as one of the most dominant lacrosse conferences in the country, providing superb preparation for Tufts’ NCAA championship push. Tufts coach Casey D’Annolfo highlighted the importance of undergoing the NESCAC gauntlet. “The NESCAC games are really important,” D’Annolfo stated. “[They’re important] in terms of where the postseason placement is, and for the NCAA tournament if we’re fortunate enough to get there.” Although the Jumbos led 10–1 in the second quarter, by the game’s end it was their third in a row decided by one goal. The Jumbos held a lead over Amherst throughout almost the entire 60 minutes of regulation, but the Mammoths trampled back, tying up the game in the fourth quarter and pushing the Jumbos to their limit. clutch to put the Jumbos up by one point with just over three minutes remaining in the fourth. In the final three minutes of regulation, both teams scrambled, attempting a combined four shots on goal between both the Mammoths and the Jumbos. Amherst attempted three of these shots, one of which shot wide and two of which Tufts junior goalkeeper Mason Pollack saved. In the end, however, none of the shots sank in the final drives of the game, allowing Tufts to escape with a 15–14 victory. Pollack saved a season-high 19 shots, and was subsequently honored as the NESCAC Men’s Lacrosse player of the week for his efforts. Pollack’s performance can be attributed to the large focus of the team on staying calm in the moment and executing its goals. Senior defenseman and co-captain Arend Broekmate, who tied his season-high of five ground balls in Saturday’s game, spoke about some of the ways the team prepares to ensure their efficiency. “We did a training program with Navy SEALS and Marines, and we learned some stuff about ourselves,” Broekmate said. “We need to focus on what’s directly in front of us instead of what we call ‘staying far.’ So that when you get to the end of whatever task you’re doing, you’re not freezing up, but you’re kind of finishing through and making sure you’re taking care of business.” This winning mindset will be crucial for the Jumbos in the upcoming two weeks, as they prepare to close out their regular season with games against unranked Middlebury on Saturday and Bowdoin on Wednesday. Jumbos celebrated Senior Day to honor their rowers that will graduate in just over a month. Eleven senior rowers were honored as part of the festivities, including senior co-captains Ryan Bell and Isaac Mudge. Jordan Bacher, Samson Braun, Rich Gilland, James Grant, Nick Hartman, Ted Midthun, James Miller, Tamas Takata and Alec Whipple round out the rest of the senior class.